Rescued from the minors and given the chance for a final fling with the franchise he rooted for as a boy in Illinois, T.J. Mathews delivered his longest and most impressive big-league performance for the Cardinals. On Sept. 9, 2001, Mathews pitched 4.1 flawless innings of relief for the Cardinals and got the win in an 8-1 St. Louis victory over the Dodgers at Busch Stadium II. Mathews retired all 13 batters he faced, striking out five. Mathews, a Belleville, Ill., native, grew up as a Cardinals fan. His father, Nelson Mathews, had been an outfielder with the Cubs and Athletics in the 1960s. In 1992, T.J. Mathews was selected in the 36th round of the amateur draft by the Cardinals. 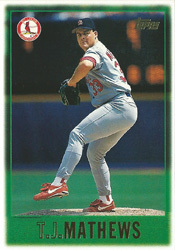 A right-hander, Mathews debuted with the Cardinals in 1995 and pitched effectively for them in relief. On July 31, 1997, Mathews was one of three players traded by the Cardinals to the Athletics for first baseman Mark McGwire. Four years later, on June 22, 2001, Mathews, 31, was released by the Athletics. The Cardinals signed him two weeks later. After three appearances for St. Louis, Mathews was sent to Class AAA Memphis. In September, when the minor league seasons ended and big-league rosters expanded, the Cardinals brought him back. On Sept. 9, 2001, the Cardinals entered the day tied for second place with the Cubs in the National League Central Division at 77-64, 5.5 games behind the Astros. With 21 games remaining, the Cardinals needed a strong finish to have a chance at earning a postseason berth as either division champion or the wild-card entry. Matt Morris, seeking his 20th win, was the Cardinals’ starter that Sunday afternoon against the Dodgers. After an inning, the game was halted by rain. The delay lasted two hours and four minutes. Morris wanted to continue. Cardinals manager Tony La Russa, concerned the long delay could hamper Morris’ ability to properly loosen his arm, sent Luther Hackman to pitch the second. “That was a real tough decision,” La Russa said to the St. Louis Post-Dispatch. Hackman pitched a scoreless second. In the third, with the Cardinals ahead, 2-0, Hackman lost command. With one on and two outs, he walked three consecutive batters, forcing in a run and enabling the Dodgers to get within a run, 2-1. La Russa lifted Hackman and brought in Mathews to face Adrian Beltre with the bases loaded. Mathews got Beltre to fly out, ending the threat. Mathews got the win, the last of his 32 in an eight-year major-league career. The win also was his first since 2000 with the Athletics and his first as a Cardinal since 1997. The win by Mathews sparked a stretch in which the Cardinals won 16 of their last 21 games, tying the Astros for first place in the NL Central at 93-69 and qualifying for the postseason as the wild-card entry. Mathews became a free agent after the season and signed with the Astros. His 2002 season with Houston would be his last in the big leagues.